After wowing the general public on the 2013 series of The X Factor with their smooth vocals, fun personalities and street style, Rough Copy are set to burst onto the music scene with their debut single, Street Love! The London trio made up of Kazeem, Joey and Sterling, now signed to Epic Records, offer a re-working of 80s classic ‘Sweet Love’ by Anita Baker, with a twist in the verses showcasing their new musical style and a lot of personality. Street Love is instantly catchy and offers a great opening tune, which is extremely memorable, especially if you know the original track – it quickly builds to produce an energetic, party vibe. However, it seems to fall flat from the initial build and the chorus leaves us feeling underwhelmed compared to that of the catchy verses. The video, teamed with the song, show the three lads chasing a beautiful woman down the street to no avail, which is completely cliche. However, the lads ensure to show their personalities and the track fits the video perfectly with it’s R’n’B, urban feel. Overall, this song is bound to achieve success and is easy on the ears, especially with the 80s vibe and has left us singing along with the track on repeat. We do, however, hope that the lads have some more tracks on their way with some of those incredible harmonies that featured during their time on the X Factor. Watch the Street Love video below and let us know what you think! Brumotions Playlist of the Week – Summer Special! Our BRUMOTIONS PLAYLIST OF THE WEEK is back! And this week, we have created an amazing SUMMER based playlist to match the fabulous weather we’ve been seeing lately! With 16 INCREDIBLE tracks, featuring a bunch of artists featured in the UK Top 40 like DJ Fresh & Maverick Sabre! Our Summer Playlist also includes the incredible new single ‘Dirty Dancer’ by Kingsland Road! And the amazing track from Austin Mahone, which features a guest appearance Pitbull, who will be seen performing at this years Fusion Festival! Covers of the Week – Rude! After another long-awaited two weeks, ‘Covers of the Week’ is back once again! And this week, we have decided to pick an amazing song, which has yet to enter the UK as an official single! But like always! An incredible song ALWAYS has a number of magnificent covers on YouTube! If you haven’t heard the original track already, check out the video below! You will not be disappointed and it’s perfect for the summer! And why not check out our top 5 covers from YouTube, which we trawled through the internet to find and share with you! So what do you all think of this week’s 5 top covers? And what do you think of this week’s chosen track?! Let us know! And make sure to check out our next ‘Covers of the Week’ on July 7th! With the boyband phenomenon still sweeping the country, there are many young, next generation boybands appearing, wishing to steal the hearts of the teenage population. Here at Brumotions, we are always on the look out for new music to tell all of you about so you can feast your ears on it, which helped us discover M.A.D, who you can also catch appearing in this weeks Brumotions Playlist of the Week! M.A.D, a trio made up of Dan Lewis from South Wales, Michael Sutthakorn from Northern Ireland and Ben ‘AB’ Pryer from London (Left to Right) – are back with their newest single ‘Shotgun’ after achieving incredible success in the Top 40 chart with their debut single ‘Toyboy’ and their second single ‘Fame & TV’, which were both released and achieved ONLINE! Shotgun is bubblegum pop at its finest! The track is likeable with a memorable and upbeat tune, which will leave a smile on your face and is perfect for a younger audience. However, we can’t help but feel that the song is slightly repetitive and bland in comparison to other songs gracing the charts at the moment. We also notice their newest tune bares a close resemblance to ‘Angel with a Shotgun’ by The Cab. With that being said, the band have boyish good looks, which combined with their inoffensive lyrics and energetic video with love declarations, leave many girls wishing they could ride shotgun with the band. M.A.D have already amassed a large online following and are a group to watch out for this year! We are sure they will continue to grow as a band and produce a more mature sound that we are sure everyone will love (including us)! Shotgun is out NOW! And can be purchased on ITunes! or like us on Facebook: www.facebook.com/brumotions for all the latest news! Showcasing her incredible vocal ability and talented writing skills with the release of her amazing new single ‘Neon Lights’, which features and has been re-released off her fourth studio album Demi. Lovato, who found popularity through various movies on the Disney Channel: ‘Camp Rock’, by starring in ‘Sonny With A Chance’ AND from judging a number of contestants on the X-Factor USA (Including our favourites, Emblem 3! ), has released the fourth track from her album on June 15th here in the UK. The lyrics showcase Lovato’s impressive vocal ability (remember she is ONLY 21!) and the rave-tastic track gets everyone dancing along. Although the single is being re-released, we have no doubt that this single will be jumping back into the charts very soon! 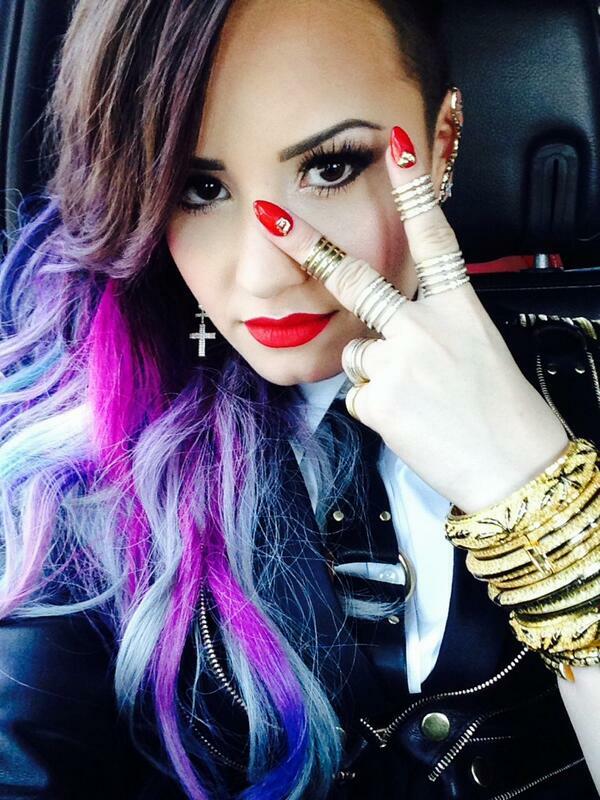 Demi Lovato is an amazing vocal talent with incredible song writing talent to match! She’s a rising talent who we are sure will be taking over the UK in due time, gaining Lovatics in all of us! And we can’t wait to see what she comes up with next! Neon Lights is out NOW! You can also see Miss Lovato touring the UK in November, during her support slot for the gorgeous Enrique Iglesias! Which includes a show at the NIA, here in Birmingham on November 27th! Hollywood Ending didn’t let us down! 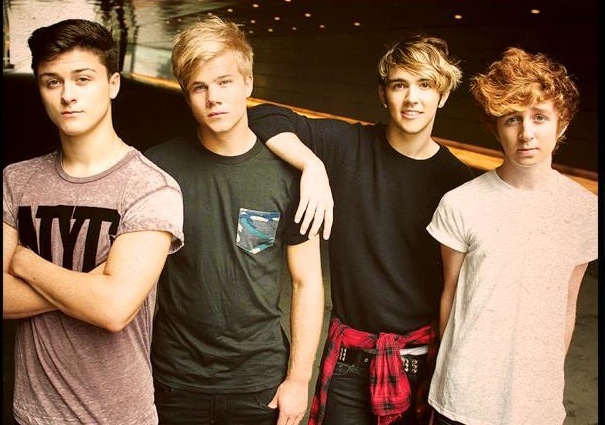 Hollywood Ending impressed a sold out crowd at their gig at the O2 Academy3 in Birmingham on Sunday night, much to the delight of their dedicated fans and Room94 who made a surprise visit after their support slot in the room next door! The group, consisting of Chris, Tyler, Danny and Cameron (Left to Right) made sure to keep the energetic crowd entertained and wanting more with a range of songs from their EP: ‘Anywhere’, including ‘Good Time Girl’ and ‘Not Another Song About Love’. The impressive set also contained a number of hilarious sections where the band and the crowd laughed along with one another – like when the lads spoke to ‘god’ who was watching the show from above to hear the boys perform their ‘Grocery Store Rap’. Although the group entertained and impressed with their relentless energy and catchy tunes, attendees were stood waiting for an hour for the first support act to arrive – though it is speculated that another support act skipped out on the show. The group, more popularly known for supporting McBusted during their gigantic tour across the UK, sold out the venue with a range of older and newer fans who shared appreciation over the talent of the group and the electric atmosphere showed how ecstatic they were to see the boys live! Hollywood Ending started their magnificent set with one of their first singles ‘Don’t Let Me Down’ and rounded it off with their newest single ‘Freak Like Me’! We would definitely recommend going to see these hilarious and incredibly talented group as they did not let us down! – They have the talent and an impressive setlist to make it far! 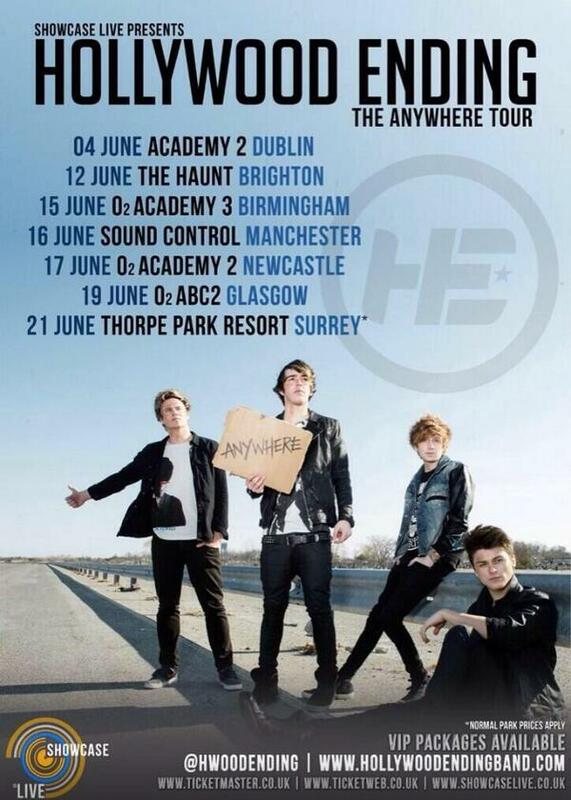 You can also order their brand new EP ‘Anywhere’, which is available NOW on iTunes!